The superiority of British seamanship and the dominating firepower of her fleet, secured Britain’s absolute mastery of the seas in the 18th century. Her artists patriotically recorded and dramatized this triumphant period and thus established the grand tradition of British marine painting. 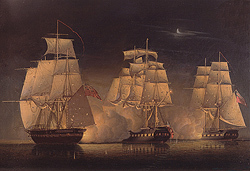 Robert Salmon emerged from this grand tradition, in the early 19th century, as a highly regarded British marine artist. The first biographical record of Salmon is on November 5, 1775, the day he was baptized in St. James parish, Cumberland, England. He was baptized as Robert Salomon, however by 1800 (while living in London) he changed the spelling to Salmon and signed his works accordingly. 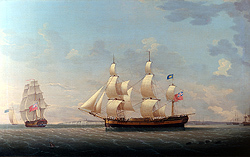 His earliest known works Two Armed Merchantmen Leaving Whitehaven Harbor and The ‘Estridge’ Off Dover are dated 1800; while the first work he exhibited at the Royal Academy was in 1802. 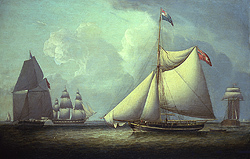 Salmon arrived in Liverpool in 1806 and began to catalogue and number each of his paintings – The Battle of Trafalgar is the first of these works. His deep love for the sea determined his destiny, for he traveled about, recording ships, coasts and crowded harbors during the great age of sail. Liverpool was one of the three seaports where he chose to reside, living there from 1806 – 1811 and from 1822 – 1825. He also spent a number of years in Greenock (1811 – 1822). In June of 1828 he emigrated to America, arriving in New York in July and spending a few months there before leaving for Boston in 1829. Boston harbor, at this time, was in its heyday and Salmon was to achieve great success there and become one of its greatest maritime artists. He remained in Boston until c.1841, at which time he returned to England. His topographical style was based on that of older English Masters and by coming to America in mid-career he was able to bring personally the older style to a new tradition of painting … his work came to have a marked influence on younger native American artists. Although Salmon was an excellent topographical draughtsman his real contribution to American art was his devotion in capturing the elusive qualities of light and rendering intimate canvases. His influence over America’s marine artists is evident in the works of Fitz Hugh Lane, Albert van Beest, William Bradford, Alfred T. Bricher, William Trost Richards, and many others.